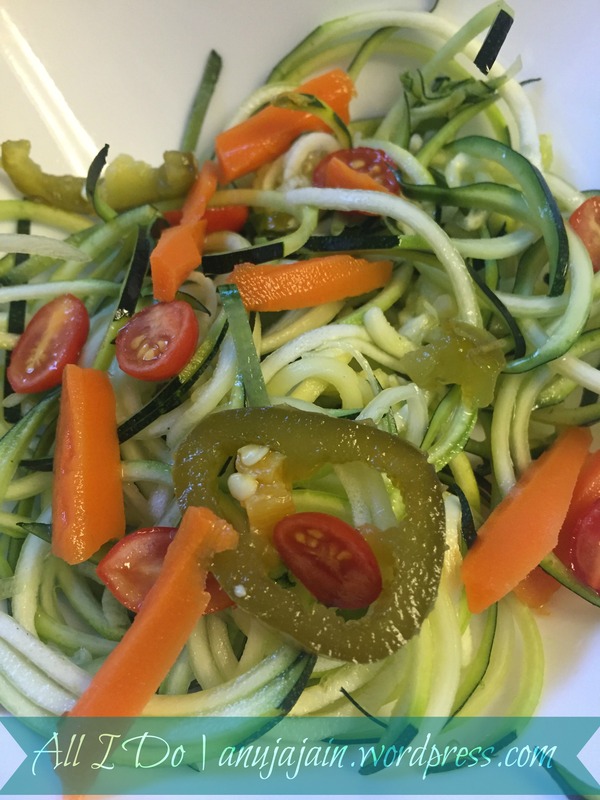 I present to you.. A minimalist zucchini noodle salad which tasted awesome without any fancy ingredients! zucchini and grape tomatoes are from my backyard garden and the jalapeno carrot pickle is homemade. I admit that a big part of the reason for that awesome taste might be emotional and not culinary. It is a wonderful feeling to sow seeds, nurture the plant for months and finally reap the fruits. I have been using tomatoes, green chilies and mint from my garden since spring but zucchini have made the debut pretty late. I did sowed some seeds in early spring and transplanted them in containers around April, but for some reason those plants didn’t survive very long. It was hard to see all those tiny zucchini heads form and die. Equipped with one experience, I planted for the second time for a fall harvest and Voila! The 3 plants have so far produced over 7 zucchini and I see 3 more heads well-formed. What do you plant in your vegetable garden?